JEE Main Exam results 2019: The result of the Joint Entrance Examination (JEE) will be released on January 31 by the NTA. All those candidates who have appeared for the same are required to check the score and rank of Paper-I at the official website jeemain.nic.in. This score shall comprise the actual marks obtained in Paper-I of JEE (Main) 2019 along with the status of those who qualify for appearing in JEE (Advanced) 2019. The rank shall comprise all India rank and all India category rank. As per the official notification, the JEE Main 2019 results are expected to be released by January 31, 2019. However, as per the pattern being followed by NTA, the result may be released earlier than expected. Students may please note that the JEE Main 2019 results for the January examination would be released by NTA which would have the 4 scores of the students. The JEE Main 2019 Ranks, however, would not be released. These would be shared only after JEE Main 2019 April examination. JEE Main Results 2019 Declared on January 19: How to check scores, AIR Rank on https://jeemain.nic.in/webinfo/Public/Home.aspx: The JEE Main Result and Rank Link has been activated on the official website jeemain.nic.in. Candidates who have appeared in the Joint Entrance Examination conducted on January 8 to 12. Joint Entrance Examination, JEE Main 2019 is currently being conducted by National Testing Agency. The JEE Main 2019 Paper II was conducted for 1.80 lakh candidates on January 8, 2019. Computer Based Test for engineering admissions would be conducted from January 9 to January 12, 2019. The JEE Main 2019 results would be released by NTA on or before January 31, 2019. To begin with, the JEE Main 2019 results would be declared by NTA by end of January 2019. As per the official notification, the results are scheduled to be released on Jan. 31, 2019. Also, the agency would also release JEE Main 2019 answer keys after the examinations are done for all the slots. All this would be done online on the official website jeemain.nic.in. No information would be shared otherwise. Students should hence constantly check the official website after the examinations are done. Students to please note that the result would have the scores of the candidate, the JEE Main Rank – AIR and also the Category wise rank. The results would also have the information on whether or not the candidate has qualified for JEE Advanced 2019.The results are expected on January 31. The answer keys for the Joint Entrance Examination (JEE) 2019 to released soon by the NTA. This year, around 10.43 lakh candidates had registered for the examination. The offline exam was conducted on January 8 and the online exam was held on January 09 and 12. JEE Main 2019 Result Update: National Testing Agency, NTA has released the JEE Main 2019 NTA Results. The JEE Main 2019 NTA scores for the January 2019 are now available on jeemain.nic.in. Students who have appeared can check their results and scores on the official website jeemain.nic.in now. The direct link is provided here. National Testing Agency, NTA has released the JEE Main 2019 Marks on the official website today, January 19, 2019. The JEE Main 2019 Rank - however, would be released only after JEE Main 2019 April examination. 1. Go to the official website jeemain.nic.in. On the home page, click on the link that read JEE (Main) January 2019 NTA Score. 2. On the new window that opens enter your application number, date of birth and security pin and click submit. Your NTA Score would be available on the screen. 3. NTA Would be releasing 4 scores - the sectional scores as well as the overall NTA Scores for JEE Main 2019. JEE Main 2019 Toppers - List of candidates who have scored 100 percentile: A total of 15 students have scored 100 percentile in the JEE Main 2019 I or January examination. As per official figures, 8, 74, 469 candidates appeared for the JEE Main 2019 Paper I examination conducted from January 8 to January 12, 2019. Check the complete list here. List of students with 100 percentile is provided below. Students who qualify the JEE Main 2019 and feature in the top 70 percentile would qualify for the JEE Advanced 2019. Indian Institute of Technology, IIT Roorkee would be conducting the JEE Advanced 2019 examination this year. As per the notification on the official website jeeadv.ac.in, the JEE Advanced 2019 would be conducted on May 29, 2019 across the country. The online application forms for JEE Advanced 2019 are expected to be released in first week of May 2019. Students are advised to note that the JEE Main 2019 Scores required to qualify for JEE Advanced 2019 may vary as JEE Main 2019 would be conducted twice this year. The next session of JEE Main 2019 would be conducted in April 2019. Students have an option of appearing in either/or both the JEE Main 2019 examination. The better of the two scores of the candidate would be considered for JEE Main 2019 Rank. The exact number of students that are expected to qualify for the examination is not known at present. It is, however, expected to be about 2.5 lakh students (or more). In other words, about 2.5 lakh students would qualify for JEE Advanced 2019. Also, this year the JEE Main 2019 Rank would be calculated based on the Percentile score and not on the raw score as such. However, the raw scores would be considered for breaking a tie in the JEE Main Rank. Given that about 9 lakh students have appeared for the examination and 2.5 lakh are expected to qualify, it can be assumed that students who would fall within 70 percentile score range may qualify for JEE Advanced 2019. Also, this year, the IITs have decided to reserve seats for female candidates. As per reports, 779 reserve seats will be allocated in various IITs for female engineering candidates. IIT Kharagpur has 113 seats, IIT Dhanbad- 95 seats, IIT Kanpur- 79 seats, IIT BHU- 76, IIT Roorkee- 68, IIT Delhi- 59, IIT Bombay- 58, IIT Guwahati- 57. The engineering aspirants who wish to get admissions in the prestigious colleges, they need to secure at least 75 per cent marks in the Class 12 exams or they need to hold the top 20 percentile in their respective state board Class 12 examination. For SC/ST students the qualifying marks would be 65 per cent in the 12th class examination. Clearing the JEE mains and advanced papers, the candidates can get through in Bachelor of Technology (BTech), Bachelor of Engineering (BE) and Bachelor of Architecture (BArch) courses. The exam is held in two stages - JEE Main which is conducted by the Central Board of Secondary Education (CBSE) and JEE Advanced which is held by different IITs every year. Percentile Score and Normalization: This year, as the examination would be conducted in multiple shifts, NTA would be using percentile scores instead of percentage or raw scores. These would be calculated after the normalization of the scores across all the slots is done. The calculation methods to be employed for normalization of JEE Main 2019 score is provided here. JEE Main 2019 results would have your overall score, and your sectional score for mathematics, physics and chemistry. Candidates have an option of appearing for either both or any one of the JEE Main 2019 examinations (January and/or April). For candidates who appear in both, the better of the two overall scores would be considered in the final JEE Main 2019 Ranking. JEE Main 2019 Ranks would be calculated only after the JEE Main 2019 April examination. The scores of either of the examination would be considered for a candidate to calculate the JEE Main 2019 rank. In case of a tie of NTA score (overall), the following would be considered to break a tie. 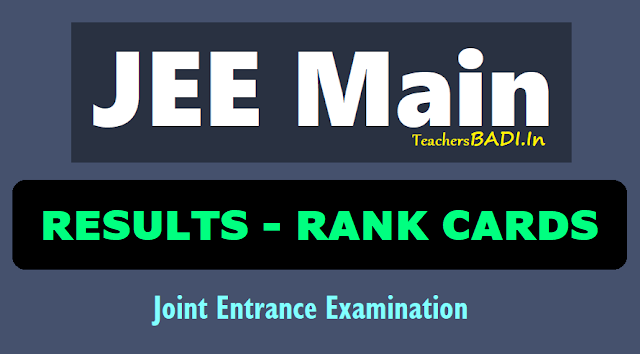 The final JEE Main 2019 result as in the JEE Main 2019 rank along with the list of candidates who have qualified for JEE Advanced 2019 would be announced only after the JEE Main 2019 April attempt. The date for JEE Main 2019 ranking, All India Merit list declaration is April 30, 2019.